Yesterday after work, my friends and I watched New Moon at Cineliesure, Orchard. The cinema was full and I was a surprised that there are a lot of Pinoys who watched. To those who haven't watched yet, don't worry there are no spoilers in this review. Here goes... 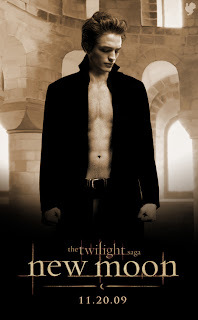 I am not a fan of Twilight from the beginning and I had a little hope for the second installment. Sadly, the movie disappointed me again and I can say that it is crappy. The parts of the movie that I only enjoyed was when the crowd in the cinema was screaming and making funny comments. I also noticed that there are a lot of shirtless scenes from Taylor Lautner. Is that even needed in the movie? One or two shirtless scenes is okay but more than that is such plain OVER. The addition of Dakota Fanning in the cast is refreshing at least there is one real actor in the movie. I just hope the acting of the main cast will improve. They only have one facial expression. By the way, I heard that a Twilight TV series is in the works. Enough of the vampire series!